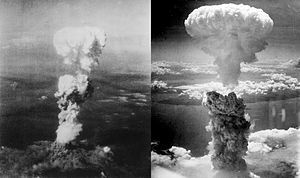 During the final stages of World War II in 1945, the United States conducted two atomic bombings against the cities of Hiroshima and Nagasaki in Japan, the first on August 6, 1945 and the second on August 9, 1945. These two events are the only use of nuclear weapons in war to date. Six days after the detonation over Nagasaki, on August 15, Japan announced its surrender to the Allied Powers, signing the Instrument of Surrender on September 2, officially ending the Pacific War and therefore World War II. Germany had signed its Instrument of Surrender on May 7, ending the war in Europe. The bombings led, in part, to post-war Japan's adopting Three Non-Nuclear Principles, forbidding the nation from nuclear armament. The role of the bombings in Japan's surrender and the U.S.'s ethical justification for them, as well as their strategic importance, is still debated.